A U.K. government agency is reaching out to blockchain startups in a competition that is focused on digital health solutions. In a notice from Innovate UK, a nondepartmental public office that is designed to promote innovation through grants and investments, it is offering up to £8 million for U.K. businesses to work on innovation projects that tackle the biggest healthcare challenges. The competition is being run through the digital health technology catalyst, which is part of the Industrial Strategy Challenge Fund. It’s designed to support the creation of digital health products that meet the requirements of the NHS. This is part of a new £35 million funding programme over four years. The competition opens today (31st July) and runs until the 11th October at 12 p.m.; however, the deadline for registrations is the 4th October, 2017. Applicants will be notified on the 17th October. It’s only open to U.K.-based firms and projects must start by the 1st February, 2018. Innovate UK stipulate that feasibility projects must range in size from total project costs of £50,000 to £75,000 and need to be completed within one year. Whereas industrial research and experimental development projects must range in size from total project costs of £500,000 to £1 million and need to be completed within three years. The aim of the competition is to speed up the development of innovative digital solutions that can be utilised for healthcare challenges, thus helping the sector to grow. This isn’t the first time that Innovate UK has funded projects in the past. In 2016, the government agency awarded £248,000 to a startup that was building a cross-border payments tool using the ethereum technology. According to a report from CoinDesk, the money was awarded to London-based Tramonex where the money was reported to be used to further the development of its cross-border blockchain tool. Once completed the prototype will be submitted to the U.K.’s Financial Conduct Authority (FCA) for approval. Last September, Innovate UK launched a new blockchain project in a £15 million competition. In the government’s Emerging and Enabling Technologies Programme, Innovate UK were seeking to ‘identify and speed up’ technology by providing funds worth up to £15 million. The aim of this competition is to help businesses broaden out innovation activities, to find new sources of revenue from new products, processes or services. Just through these competitions and projects it shows how important new technologies such as the blockchain is to Innovate UK and how much they want the country to harness its potentials. There are several competitions taking place that are aiming to find the next big thing in the blockchain space. In Hong Kong, a technology programme is hoping to unearth the next fintech blockbuster. In a report from the South China Morning Post, 10 technology startups have been selected for a 12-week mentorship programme that is backed by 18 major financial establishments. These include companies from Hong Kong, South Korea, Singapore and the United States, who are aiming to implement innovation that could aid financial institutions within the Asia-Pacific. Accenture’s FinTech Innovation Lab Asia-Pacific is who picked the 10 technology startups. According to the SCMP, some of the technology startups include Block, a South Korean blockchain infrastructure provider; CoverGo, a Hong Kong-based company that automates manual insurance processes; KapitalWise, a U.S. startup, that provides a micro-investment platform; and microUmbrella.com, which delivers a micro-insurance buying and claims platform. Now more than ever, financial firms need to maintain pace with the rate at which the technological world is developing. For it to ensure this, it must embrace fintech, but the only way for that to be achieved is for the finance sector to research new methods of doing things. To do so, means a more efficient system that is free from errors and cuts down on costs. As the former CEO of Barclays once said, the financial services sector needs to open itself to fintech if it wishes to remain relevant. A new survey has been released by India’s market and trade body that shows while 97 percent of Indian traders are aware of bitcoin, it’s use among them remains low. At a meeting called ‘Roundtable on Industry Perspective on Bitcoins: A New World of Payments and Deals,’ the PHD Chamber of Commerce and Industry, which overseas India’s industrial development, asked over 200 participants from a range of industries if they were aware of the digital currency. These included traders from electronic devices, fabrics and automobile parts industries. The objective was to see what impact bitcoin was having on companies within India. According to the findings, though, while 97 percent of Indian traders are aware of the digital currency, its use within their services remains low. He added that the use of bitcoin brings with it huge risks and that it is only the demand for it that is seeing increased optimism. News of this will no doubt surprise many. Only recently a professor of finance at New York University said that digital currencies such as bitcoin were replacing gold among the younger generation in India. With many of India’s nation losing confidence in its currency a rising number of the country’s citizens have been turning their attention to bitcoin. This is particularly the case among the 18-35 age group. This may be down to the fact that last November India’s prime minister Narendra Modi removed 86 percent of the nation’s currency overnight. With many of the population left in the lurch a significant rise in bitcoin trading was experienced. At the moment the discussion of regulating bitcoin in the country is undergoing. In the past there have been calls from Indian politicians to declare bitcoin illegal. According to Kirit Somaiya, a member of the Indian Parliament who belongs to the Bharatiya Janata Party (BJP), a right-wing party in India, he has considers bitcoin as a pyramid-ponzi scheme and has termed it as such in the past. However, it’s unlikely that the digital currency will be declared illegal in the country after the Indian government set up an interdisciplinary committee to look into the risks associated with bitcoin. Of course, one of the issues with the digital currencies regulatory regime, is who will oversee it. Only recently it was reported that the Indian government was considering putting a ‘goods-and-services tax‘ on bitcoin purchases in light of the regulatory discussion. India certainly has a wide reaching market that can benefit from the use of digital currencies, particularly considering that India has one of the fastest growing smartphone markets in the world. It, therefore, remains to be seen what the government will decide who will oversee its regulation. Yet, with a young market that can help boost the adoption of the digital currency, it may be surprising to many to learn that its use still remains low within many industries. Unlike India, Japan has taken the step of legalising the digital currency so that it can be used as a form of payment for goods and services. So much so, that by the end of 2017, it’s expected that there will be 300,000 stores accepting the currency as a form of payment. Low-cost Japanese airline Peach Aviation Ltd., announced earlier this year that it would start accepting the digital currency as a form of payment for flight purchases. According to the CEO of the company, it is hoped that by accepting bitcoin for flights it will attract tourists to the country after a rapid growth of the currency in Japan. Such a move has helped push the country and the cryptocurrency forward as its real world value becomes more prevalent. Even though India doesn’t appear likely to term it as a currency like Japan has, it still marks a significant step forward for the country. It also highlights India’s interest in pushing for a digital economy, which finance minister Arun Jaitley has been pushing for since the country’s demonetisation last November. With rising interest in the digital currency being witnessed in India, officials are keen to ensure that the public aren’t taken advantage of from companies that deal with bitcoin. So much so, that the Ministry of Corporate Affairs (MCA) informed the Serious Fraud Investigation Office (SFIO), regional directors and the Registrar of Companies to collect information on the firms that are involved in bitcoin. It’s hoped that by doing so they can keep on top of any potential risks they may need to take care of. Bitcoin may not be banned in India, but the fact that it’s not regulated can pose a risk to people who don’t fully understand what it is. It remains to be seen whether more traders will start using the digital currency in their services once it has been regulated. Russian airline S7 has revealed that it is now utilising the ethereum blockchain to sell flight tickets with backing from the country’s largest private bank. Reported in regional newspaper Kommersant, Russian airline PJSC Siberia Airlines, known as S7, and Alfa-Bank started using the blockchain to sell flight tickets on Monday 24th July. The report states that one of the key benefits was faster settlements. However, this is not the first time that S7 has experimented with the blockchain. In December, the airline undertook the first-of-its-kind payment service with the ethereum blockchain smart contracts through a letter of credit with Alfa-Bank. Aeroflot, Russia’s largest airline, is also conducting research into the technology, namely digital currencies and how they can be used for flight ticket payments. The experiments with S7 and Aeroflot are expected to end the 10th December, 2017. S7 is not the first airline carrier to embrace this innovative technology. There have been several airlines to do so before. The most recent is low-cost Japanese airline Peach Aviation Ltd., which announced earlier in 2017 that it was to start accepting bitcoin as a form of payment for flight tickets. After the recent interest in the digital currency, which has seen rapid growth in Japan in recent months, it is hoped this will provide an attraction to tourists to visit the country. The heightened interest in bitcoin in Japan is due to the fact that in April regulations were changed which now see the digital currency as a legal form of payment for goods and services. As a result, it’s expected that by the end of 2017 there will be as many as 300,000 stores in Japan accepting bitcoin for payments. Aside from Peach other airlines have also embraced the most popular digital currency for their services too. These include Latvian airline airBaltic, LOT, the Polish airline and Washington D.C.-based airline Universal Air Travel Plan (UATP). Three years ago, airBaltic revealed that it was to begin accepting bitcoin payments in an attempt to focus more on the customer. By taking this step the airline became the world’s first to accept the digital currency for its tickets to 60 destinations in Europe, the Middle East, Russia and the Commonwealth of Independent States (CIS). In 2015, LOT announced that it was going to start accepting bitcoin for its flights to over 60 destinations as well. UATP also revealed in 2015 that it had joined up with Bitnet as a payment processing partner. As a result, the U.S. airline now has the opportunity of providing its network of over 260 airlines the option of accepting bitcoin for flight payments. These are just a few of the airline carriers which are embracing the digital currency who see the benefits it can provide to customers. This is in contrast to Morgan Stanley’s claim that bitcoin acceptance among top merchants is in decline. While Russia appears to see many benefits with the blockchain – after all, ethereum’s founder, Vitalik Buterin, is reported to have met with Russian President Vladimir Putin – the country is still sitting on the fence when it comes to bitcoin. However, its current stance is somewhat different from where it lay in 2016. Last year, a new amendment to the Criminal Code by the Ministry of Finance in Russia saw the regulator proposing a seven-year prison sentence for management and executives of banks and financial services firms for the use of bitcoin. The sentence was less for everyday people caught using it at four years. Fast-forward to 2017 and the country has shifted gears after the central bank’s governor revealed that the authority is ‘analyzing’ the possibility of regulating the digital currency. Yet, Elvira Nabiullina, governor of the Russian Central Bank, stated that she views bitcoin as a ‘digital asset’ instead of a currency. She also claimed that there were some doubts as to what benefits the digital currency could bring to the economy. While it’s not clear as to what Russia’s next move will be, in an April Bloomberg report Deputy Finance Minister Alexey Moiseev said that the Russian authorities hope to regulate digital currencies such as bitcoin by 2018 as they undertake steps to enforce rules against illegal transfers. This will no doubt help bump the price of the digital currency up while also increasing its user base in the currency. As of the 26th July, the price of bitcoin has dropped to $2,490 with the total market cap of all currencies down to just under $85 billion, according to CoinMarketCap. In a 24-hour period, the price of bitcoin dropped by 2.14 percent while the market cap has yet to climb back up to $90 billion. It’s thought that this recent slump is down to caution among investors in light of the potential Bitcoin Cash (BCC) hard fork that is expected on the 1st August. Now supporting Bitcoin Cash, Ver claims that projects such as Omni and Counterparty would choose Bitcoin Cash. Featured image from Flickr via Takashi Nakajima. The South African Reserve Bank (SARB) has announced that it will begin testing regulations for digital currencies such as bitcoin. During the first seven months of 2017, the digital currency market has experienced huge gains with slight drops in between. At the beginning of the year bitcoin was valued at $1,000; however, its price has since climbed through the $2,000 barrier and even scaled further than $3,000 in June. Recently, though, the value of bitcoin dropped to below $2,000 in light of the scaling debate. Many in the community previously believed that digital currency was going to undergo a coin split, which pushed its price down as holders keen to make a profit, while they still could, sold the coins they were holding. Of course, now that BIP 91, the network protocol upgrade for bitcoin, has been locked in by miners the value of the digital currency has risen to $2,710, as of the 24th July. This in turned has had a positive impact on other altcoins, which also took a price tumble when bitcoin did. On the 16th July, Ethereum’s price dropped by 22 percent to $159 and 60 percent from its June high when it was over $400. At the moment ether is trading at $223, according to CoinMarketCap. Of course, with some claiming that bitcoin has been in a price bubble it has naturally attracted the attention of authorities who think regulation is the way forward. One organisation is SARB, which is currently having discussions with blockchain-based solutions provider Bankymoon. In a report from BusinessTech, Loerien Gamaroff, CEO of Bankymoon, said that the provider had been chosen by the bank as its first sandbox business to undertake an experiment with new digital currency regulations. According to the report, Gamaroff has been part of a number of workshops and seminars focusing on digital currencies within the South African market. He states, however, that at this stage the two are working together to determine where the relationship can go for future development. He adds that this step toward possible regulation will help at providing a more formal foundation and gives legitimacy to bitcoin that people will be able to trust. Last August, the SARB revealed that it was open to the innovation of digital currencies and the distributed technology ledger with the bank’s governor claiming that the financial establishment is willing to consider the benefits that these technologies present. Bitcoin Regulation in South Africa? At present bitcoin remains unregulated in the nation; however digital currencies aren’t prohibited or banned outright in the country. As such, the use of them is growing as more people turn their attention to them despite the fact that a joint advisory was released in 2014 warning the public on the risks linked to the use of digital currencies. According to Kerri Crawford, a tech lawyer at global financial law firm Norton Rose Fulbright based in Johannesburg, she thinks that as the uptake of digital currencies increases there is a chance that South African authorities will take a regulatory approach. As more jurisdictions think about implementing a regulatory stance toward digital currencies such as bitcoin it could be that they begin to outpace fiat currencies in the future. This was the thinking from Michael Jordaan, the former CEO of one of South Africa’s ‘Big 4’ banks, the First National Bank (FNB). In June, Jordaan said at the Software AG Innovation Tour 2017 event in Johannesburg that by 2025 digital currencies will compete with national currencies as trading volumes continue to rise. According to a report he said that cryptocurrencies had the potential to make banks become obsolete as they continue to challenge the current banking model. Interestingly, his word echo those of former chief of Barclays bank who was reported as saying that the financial services sector needs to embrace the world of fintech if they wish to remain relevant or they could become obsolete. His words follow on from a 2015 prediction when he said that there was going to be an ‘Uber-like’ disruption from the fintech sector that would change the current banking system. As a consequence, he believes that in 10 years time those working within the banking establishment will have been reduced by 20 percent, but could go as high as 50 percent. It remains to be seen what result South Africa’s central bank comes to when it completes its trial looking into digital currency regulations; however, it would certainly be a step forward for the country as it looks at embracing innovative technologies. By doing so, it will join the likes of Japan, which in April changed their regulations that now considers bitcoin a legal form of payment. Featured image from Flickr via Paul Saad. According to a report from financial research firm Autonomous NEXT, in the first six months of 2017 more than $1.2 billion in digital currency was raised through ICOs, outpacing venture capital investment in blockchain and bitcoin companies. Furthermore, in the last 30 days around $600 million has been raised. Of the ICOs by category, media and social has raked in just under $150 million in 2017 while gaming and gambling has raised less than $80 million. Since the start of the year, the digital currency ether has jumped in value from $8 to around $400 in June. As of the 19th July, ether has dropped in value and is currently trading at $224, according to CoinMarketCap. As a result, its total market value has seen a decline bringing it down to just under $21 billion. Hoskinson, who was part of the ethereum network between 2013 and 2014 and now runs technology research firm IOHK, is adding his voice to a growing number of individuals who are concerned about the way ICOs are increasing at a rapid pace, which is delivering a surge in prices. However, the rise and fall in ether prices is not just down to the increasing number of ICOs on the market. Other factors have also contributed to the shift in market prices. In latest developments with ether, its price has dropped by 10 percent as of the 20th July to $211. This is the latest setback that the digital currency has experienced in a matter of days. On the 17th July, it was reported that around $7 million had been stolen by a hacker during the CoinDash ICO. The hacker was able to do this after altering the contract address of the ICO project. Fast-forward a few days and that number has been bumped up to $10 million as unsuspecting potential investors willingly hand over their money with 43,500 ether believed to have been sent to the fake address. 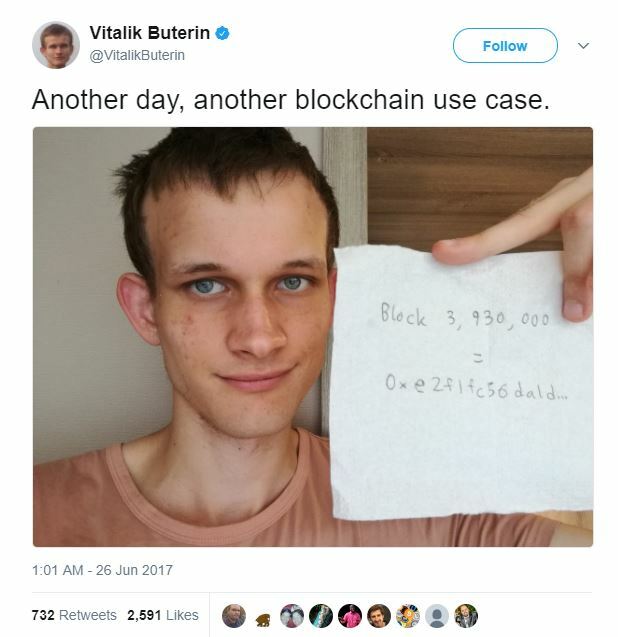 In late June, it was reported that ethereum’s founder Vitalik Buterin had to employ the blockchain network in a bid to disprove his death. In a report from CoinDesk, it’s alleged that the death hoax came from an internet forum site – clicking on the web page brings up a ‘404 not found page’ – stating that Buterin had died in a car crash. Following the rumours the founder of the second most popular digital currency no doubt wanted to quickly quash any further speculation. He did this by announcing on social media that he was in fact alive including an ethereum block number and a hash that corresponded to it. However, while Buterin may have put an end to the rumours that he had died, he wasn’t able to prevent the price of ether from dropping below $300. Another factor that is creating price waves within the cryptocurrency market is the talk that there could be a bitcoin split if a solution isn’t finally agreed upon to solve its scaling issues. On the 15th July, the digital market saw its total value drop below $70 billion for the first time while the price of bitcoin suffered a 49-day low when it dropped below $2,000. The following day, ether prices fell by 22 percent to $159, a 60 percent decline from its record high in June. And yet while early signalling support has started for BIP91 which would prevent a coin split in the bitcoin blockchain network, and prices have risen, there is still some concern as to what will happen come the 1st August. Hoskinson thinks, though, that when it comes down to it regulation is the biggest challenge to the market and that the Securities and Exchange Commission (SEC) will, essentially, label digital currencies as securities. He says that because digital ICOs don’t come with the risk safeguards that traditional security sales provide, future lawsuits could present themselves with investors claiming that they weren’t aware of the risks involved. The digital market is certainly going through an interesting readjustment phase. How long it will last remains to be seen. Yet, with more ICOs being reported on frequently it’s clear that they provide the ideal avenue to raise funds for many companies. Just as bitcoin’s price has risen and fallen during its history, so too will ether’s price. Of course, while bitcoin has store value and can be utilised for goods and services, ether isn’t. With the 1st August looming ever closer, a resolution to bitcoin’s scaling issues may finally help its price, which in turn may help to bump the price of ether back up as well. Featured image from Flickr via tiendientu vietnam. The deputy governor of Egypt’s central bank has rejected claims that bitcoin adoption will take place at the country’s banks. In a statement posted on Arabian news site Amwal Al Ghad, Lobna Helal, the Central Bank of Egypt’s (CBE) deputy governor, denied reports that the bank was permitting banks to handle bitcoin adoption. Similar comments also came from Gamal Negm, another deputy governor and director of the CBE, who flatly refused the rumour that the CBE was going to accept bitcoin. According to a report, the rumours circulating the central bank’s bitcoin adoption stemmed from social media around the 16th and 17th June. However, any such possibility was quickly denied by officials at the bank. These comments come at a time when several jurisdictions around the world are contemplating how to classify the digital currency and whether it should be regulated. Japan is quite possibly becoming widely considered a forward-thinking country when it comes to the adoption of bitcoin. In April, the country changed its payment regulations, which now sees the digital currency as a legal form of payment for goods and services. As a result of this attitude change to bitcoin it’s believed that by the end of 2017 there will be around 300,000 stores accepting it as a form of payment. Considering the negative experience the country has had with bitcoin in the past, with the now-defunct digital currency exchange Mt Gox, the country’s interest in the market has been reawakened. As a result, this new influx of Japanese traders has helped to push the price of the currency up in the past. In June, the price of bitcoin soared past the $3,000 for the first time. Low cost Japanese airline Peach Aviation Ltd., is just one such company that is due to start adopting bitcoin by the end of the year. It is hoped that the rapid appreciation that the digital currency has been experiencing lately in Japan will attract tourists to the country. Russia too is another country that should be given due credit to its position with bitcoin adoption. In the past the Russian government has been against the acceptance of the digital currency. So much so that last March, management and executives of banks and financial services firms who were found to be using bitcoin faced a seven-year prison sentence. Whereas everyday individuals caught trading it faced a sentence of at least four years. Now, though, the country has eased its stance on digital currencies such as bitcoin and while it is exploring the possibility of regulating it, it’s not sure whether to class it as a currency or an asset. At the beginning of February, the Philippines released new guidelines for bitcoin exchanges operating in the country. The move by the Bangko Sentral ng Pilipinas (BSP) essentially signals the recognition and legalisation of bitcoin activity within the country. Also noteworthy is India, which is one country that is currently debating how bitcoin should be regulated. While the digital currency is unlikely to be banned in the country, the question as to who will oversee its regulation remains unanswered. However, given the fact that the adoption of bitcoin is widely used among a large percentage of 18-35-year-olds, it remains to be seen what impact regulation will have on the population who remain supportive of it. If, and when, it becomes regulated it could help propel the currency to a population of 1.3 billion people that is home to the fastest growing smartphone market in the world. The first half of 2017 has seen a rapid appreciation of bitcoin. At the beginning of the year its value was trading at $1,000, but by the beginning of June it has soared to over $3,000. With an increase in the number of traders investing in the digital currency around the world claims were circulating that it couldn’t sustain its pace, was in a bubble and was likely to burst with rapid downfalls. Seven months into 2017 and the price of bitcoin is trading at $2,311 on the 18th July, according to CoinDesk’s Bitcoin Price Index (BPI). Many would say that the price of the currency has certainly burst. Not only that, but it was recently trading below $2,000 for the first time in a 49-day low on the 15th July. As a result, the market cap value of all digital currencies dropped to nearly $70 billion. The highest it has achieved is $115 billion, which it achieved in June. However, while bitcoin’s value had dropped significantly from its June record, digital currencies across the board have also slumped. As a result, many are claiming that what the community is witnessing is not a bubble, but the result of a looming deadline which could solve bitcoin’s scaling issues. Meanwhile Andreas Antonopoulos, author of ‘Mastering Bitcoin,’ said recently on social media, that the decline in the price of the digital currency market was due to a price correction given the fact that it has seen a 1500 percent rise in two years, particularly in the last three months. With the 1st August deadline looming, all the bitcoin network can do is wait and see what impact the upcoming activation of SegWit2x will produce on it. It is hoped that this solution will answer the needs of the community who have often faced a backlog of transactions as they wait to join the blockchain. Even though miners were expected to start signalling for the proposed solution until later in July, some miners have already signalled their support for it in an advanced move. According to a report from CoinDesk, around 43 percent of bitcoin’s mining power has signalled for the change. These include the likes of Antpool, BTC.com, BitClub and BitFury. While it may be a surprise it is likely due to the need to upgrade the network protocol before the 1st August deadline. Featured image from Flickr via Dennis Jarvis. The value of bitcoin is up by 250 percent in 2017, but according to research conducted by Morgan Stanley, bitcoin acceptance has seen a decline among top merchants. For a digital currency that is working at becoming a mainstream currency that people use for their day-to-day purchases, could this be the beginning of the end for it? According to a research note by analysts at the leading global financial services firm led by James E Faucette, it said that ‘bitcoin acceptance is virtually zero and shrinking,’ even though the digital currency has soared in value over the past seven months. The bank goes on to say that in 2016 bitcoin acceptance was seen at five of the top 500 online merchants; however, fast-forward to today and that number has dropped to three. While this figure is hardly drastic, it does highlight what many merchants may be thinking, and that maybe adding bitcoin to their payment options is not worth it. One of the main reasons for this drop in bitcoin acceptance is due to an increase in bitcoin’s price value. Naturally, when the price of the digital currency goes up, people appear unwilling to let go the coins they hold. Keen to make a profit on their holdings, they are unlikely to pay for goods and services with it. As of the 13th July, the price of bitcoin is trading at $2,412, according to CoinDesk’s Bitcoin Price Index (BPI). Yet, while this price is significantly lower than its historic June high of over $3,000, people are being urged to hold on to their coins with many speculating that the price will go back up again in the near future. Online furniture retailer Overstock.com revealed that it now takes in around 100,000 bitcoin transactions a week, compared to 30,000 which it reported in 2016. While energy provider Switch, owned by EnergieAllianz Austria that operates in Austria and Germany, has revealed that it now accepts bitcoin in Austria. It remains to be seen whether this will also extend to Germany in the future. Meanwhile, an identified man was reported as holding up a ‘buy bitcoin‘ sign yesterday during a testimony that Fed Chair Janet Yellen was presenting before the House Financial Services Committee. Delivering a monetary policy report to Congress on the state of the economy, Yellen didn’t make any reference to the digital currency; however, the man was subsequently removed from the hearing room after violating the House committee’s rules on holding up signs. While bitcoin hardly needs any free advertising to bump its price up, this will no doubt have helped to push the bitcoin agenda that received several seconds of air time. For many the idea of whether bitcoin should be classified as an asset or a currency is a never-ending debate. Interestingly, the fact that holders of the digital currency are not willing to use their coins for purchases could mean that they see bitcoin for investment purposes only and not to pay for things. Recently a central advisor to the People’s Bank of China (PBoC) said that bitcoin didn’t meet economic developments to be held as a currency, but that it should be viewed as an asset. According to the advisor, the fact that bitcoin was capped at 21 million meant it would be hard for the currency to gain prominence. His thoughts follow Russia’s Central Bank, which has been weighing the pros and cons over whether to regulate bitcoin. According to Elvira Nabiullina, governor of the Russian Central Bank, she views bitcoin as a digital asset rather than a currency. India, too, has been looking into the role that bitcoin can play and if it should be banned or regulated. A full intergovernmental committee report is expected to be released later in July on its findings; however, it’s unlikely that a ban will be the chosen decision. One country that has had a complete change toward bitcoin is Japan. Previous experience with bitcoin and digital currency exchanges such as Mt Gox have left a sour taste in most investors’ mouths. As a consequence, investors have turned away from it. Only recently the CEO of the now-defunct Japanese exchange, Mark Karpelès, pleaded not guilty to embezzlement charges relating to the disappearance of 650,000 bitcoins in 2014. And yet, while thousands of investors of Mt Gox wait for some form of compensation, merchants and investors are turning their attention back toward bitcoin. In April, the country changed its payment regulations, which now sees bitcoin as a legal form of payment option. As a result, 300,000 merchants are expected to offer the cryptocurrency to customers by the end of 2017. One of which is the low-cost Japanese airline Peach Aviation Ltd., which announced that it will be accepting bitcoin to customers who want to pay for flight tickets. It is hoped that by doing so, the recent fascination with the digital currency will help to attract more visitors to the country. Yet, even though Morgan Stanley have said that the rate of bitcoin acceptance is dropping among top merchants, it clearly still holds plenty of value for millions of people. Even though there will be people who are simply holding the digital currency as an investment vehicle rather than as a payment choice, countless others will be using it for goods and services. Take India for instance. Last November, the country was faced with a cash crisis when the government wiped off around 86 percent of the country’s national currency overnight. In a bid to tackle the black market, the Rs 500 and the Rs 1,000 banknotes were removed, leaving citizens unsure of the future. The currency they turned to was bitcoin. Decentralised and transparent, it offered the safe haven that many were seeking in their time of need. As a result, the rate of bitcoin’s acceptance grew with an increasing demand for it among the 18-35 age range. Yes, the digital currency may have been dropped by a few top merchants, but this is by no means the end of the currency. It still has plenty of room to grow and who knows what 2018 will produce? Maybe the number of merchants accepting it will increase, particularly after it solves its scaling issues. The former CEO of the now-defunct bitcoin exchange Mt Gox is preparing to head to trial in Japan next week where he faces embezzlement charges relating to the disappearance of around 650,000 bitcoins. It was back in August 2015 that Karpelès was first arrested with allegations that he had manipulated bitcoin volumes at Mt Gox. The following month he was charged with the embezzlement over the loss of hundreds of millions of dollars worth in bitcoin. It was reported, at the time, that Karpelès had stolen 321 million yen in the digital currency. Launched in 2010, Mt Gox quickly became a popular bitcoin exchange for the countless enthusiasts of the digital currency seeking a place to buy and sell the currency. However, throughout its existence it was blighted by troubles, suffering a hack as early as the summer of 2011 and a lawsuit filed against Mt Gox alleging a breach of contract. Despite this, though, by 2013 and into 2014 it was claimed that the exchange was handling around 80 percent of all global bitcoin trading as it became the world’s leading bitcoin exchange. However, it wasn’t until November 2013, when bitcoin trading reached a new high of $1,300, that the exchange’s troubles took on a new level, bringing the community and the digital currency’s price crashing down. At the beginning of February 2014, Mt Gox halted all bitcoin withdrawals, stating that it would continue indefinitely after detecting ‘unusual activity.’ On the 10th of February, the team at Mt Gox released a company statement, saying the issue was because of a transaction malleability. Yet, by the 20th of February, bitcoin withdrawal services had still not resumed. By the 23rd, Karpelès had resigned from the board of the Bitcoin Foundation and on the 24th Mt Gox suspended all trading and went offline. By the end of February, Mt Gox had filed for bankruptcy protection in Tokyo and later in March for bankruptcy protection in the U.S. leaving a trail of angry investors demanding answers. With the company admitting that it had lost 750,000 of its customers’ bitcoins in addition to 100,000 of its own, Karpelès appeared on television to apologise and say that all the coins are ‘almost all gone.’ Subsequently, this news dented the reputation of the currency. At the time, the loss of the 850,000 bitcoins was worth around $500 million, representing about seven percent of the estimated global total number of bitcoins. Fast-forward a month later and the bitcoin exchange posted on its website that it had found 200,000 bitcoins worth around $116 million in an old wallet that had been used in 2011. However, three years later and the mystery over the remaining missing bitcoins has continued to cause many to speculate where they could be. According to the Japan Times, Karpelès led a rich life and is reported to have lived in an $11,000-a-month penthouse spending money lavishly, including on prostitutes. As things stand a court-appointed Toyko trustee in the Mt Gox investigation has completed a review of 24,750 individual claims by creditors as the reimbursement of lost funds to creditors takes shape. If Karpelès is found guilty, he could face up to five years in prison and a fine of 500,000 yen or $4,000. In light of the Mt Gox collapse, Japan passed a bill stating that all digital currency exchanges were required to be regulated by the Financial Services Agency. It may have been three years ago when the Mt Gox scandal broke, but in Japan wounds run deep. So much so, that the country has shied away from digital currencies and what they stand for until recently. After Japanese regulations changed in April, which now sees bitcoin as a legal form of payment, thousands of merchants have stated that they will accept the digital currency by the end of 2017. This reawakened interest in the digital currency has helped to push its value up as a new wave of investor interest turn their attention to bitcoin. Of course, even though the most popular cryptocurrency has had a troubled past it still remains a viable alternative for many people around the world. As a result of this new influx of investors, the price of bitcoin soared to its highest yet in June where it was recorded at over $3,000. It has since settled back down to $2,450, according to CoinDesk’s Bitcoin Price Index (BPI), but considering it was struggling to break the $1,000 barrier at the end of 2016 it has come a long and significant way. It remains to be seen how much further the currency can go and even though it will still be a currency that is used by criminals it’s hoped that bitcoin has reached a new level of maturity that its price won’t be too affected if such a negative situation involving bitcoin arises in the future. Featured image from Flickr via Trân Trân.